This is the album for keeping documents or photos on somebody's 65th anniversary. It is the rare specimen of Fedoskino lacquer miniature production, because usually Fedoskino artists paint on boxes or plates. The exterior of the album is covered with black lacquer, whereas its interior is covered with bright red satin material. 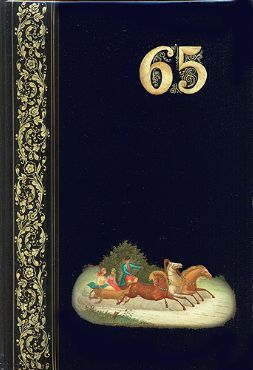 A wide band of gold floral patterns decorate the left side of the album; there is the figure "65" painted in gold paints and decorated with beautiful filigree in the upper right corner that indicates the anniversary of some important event; and at the bottom of the album there is the painting that shows the summer troika. It is painted in oils with the addition of aluminum powder and a gold metal to produce a beautiful decorative effect. The painting is signed with the artist's name (A. Kriger), the village of Fedoskino and the year of 1997.